This entry in the Why This Book Should Win series is from George Carroll, former and future BTBA judge, soccer fanatic, world literature correspondent for Shelf Awareness, and curator of litintranslation.com. 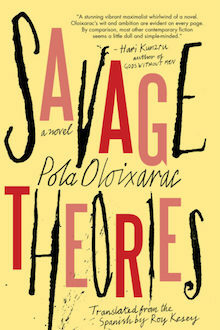 I would seriously love to write a piece on why Pola Oloixarac’s Savage Theories (translated from the Spanish by Roy Kesey) should win the 2018 Best Translated Book Award, but it’s a Jurgen Klopp / Mo Salah problem. Should Klopp have played Salah in Liverpool’s second leg of the Championship League semi-final against Roma even though his side was up 5 -2 from the first leg? Do you start your best player when he’s obviously running out of gas and you need him for a critical Premier League match? And is it fair to have Salah (the best player in England, well, maybe Le Bruyne), burn his minutes in a playoff that’s almost a done deal and hamper his chance at the Golden Boot? This aligns with my participation in the 2019 Best Translated Book Award. I don’t write a lot and when I do, it’s really mind-numbing. I have no aspirations to be a writer, mostly because I have nothing to say. So, even though I’m a big fan of Savage Theories, I don’t want to contribute to the 2018 discussion when I’m going to be on the 2019 jury and I’m going to have to write regular posts and a why-this-book-should-win thing for next year. I should sit on the bench and champion the @BTBA2018 team on. All I’m going say is that I drop Savage Theories into the same basket as Laurent Binet‘s The Seventh Function of Language (which didn’t even make the 2018 BTBA longlist, seriously, WTF?). Both books made me suspect that I was mistakenly advanced a grade. Or when I got an A in high school physics when it should have been obvious that I had 1) not cracked the textbook, ever, and 2) submitted the same answers on tests as Greg Herlick, who sat right in front of me. Honestly, I’ve never heard of Palito Ortega or Roger Trinquier or Alfred Adler or Basilides of Alexandria or Philip II of Macedon. Maybe I have, but like beer, I don’t own it, I just rent it. But that doesn’t really matter because Oloixarac’s references are like speed bumps – if you go over them fast enough, they don’t really hurt that much. I admit to doing the Google / Wikipedia thing a few times, maybe more than a few, just to make sure she wasn’t messing with me. Savage Theories should win this year’s award because it works. Just when you think a shot is going off-frame (another soccer reference) there’s a bend and it hits the back of the net. Like Binet (yeah, I’m going back there again) Oloixarac is insanely, truly insanely, talented and the book gives the oft-justified criticism of literature in translation as dark, depressing and too-serious-for-its-own-good a nice, sharp poke in the something.